Bishop Park does not allow subleases because the community feels it's important to know who's living in each apartment. If you're a student heading home for the summer or if your company is transferring you to a new town, you may be looking to find someone else to move into your apartment. What can you do to find someone to move into as soon as possible? Subletting and reletting your apartment (or a room in your apartment) are two distinct rental agreement options you may be considering. So, what does it mean to either sublet or relet apartment? What is the difference between the two? How can you know which option is right for you? I had to opportunity to speak to Bishop Park Apartment's property manager, who gave me the run down on subletting and reletting. Here's everything you should know before you either sublet or relet your apartment. What Does it Mean to "Sublet" My Apartment? Subletting (or subleasing) is a rental arrangement that occurs when you (a resident on the lease, also known as the "sublessor") rent a room or entire apartment to someone else (the "sublessee"). This new resident will pay rent and adhere to the lease's terms. What are the Downsides to Subletting My Apartment? As the original resident, you are responsible for the lease. If the sublessee decides not to pay rent, you're liable for the back rent and the apartment community has the option to sue you to get what they're owed. You also take responsibility for the actions of your sublessee. If the person you're subletting your apartment to decides to throw a party and completely trashes the apartment (or any part of the community's property), it's on you. Bishop Park's property manager told me that the #1 thing renters should know about subleasing is that it allows someone to move in to a residence without any formal lease agreement. This means that they haven't been screened for credit, criminal background, or rental history. She added "reletting allows us to do all of that and therefore have record of who is actually living at our community, which also enables us to encourage a resident-landlord relationship with the renter." While you may know who you're subleasing your apartment to, the apartment community will not have that information on record. Most apartments communities will want to know who is living in the apartment, and will need to ensure every resident over the age of 18 has satisfied the community's required credit and criminal background check requirements. Many communities will not allow a subleasing arrangement because of this. If you sublet any portion of your apartment without permission in a community where subleasing is prohibited, you could be in breach of your original contract. What Does it Mean to "Relet" My Apartment? If you decide to relet your apartment, the community will have the new resident sign a brand new lease. This releases you (the original resident) from your obligations as a resident of that apartment. A reletting rental arrangement is a new and distinct contractual relationship between the community and the person reletting your apartment. 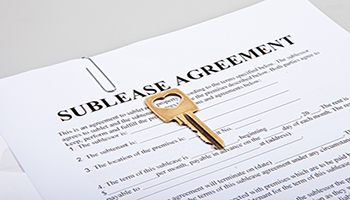 Reletting is most beneficial if you need to terminate your original lease agreement. What are the Downsides to Reletting My Apartment? Regardless of the reason for breaking your lease, your community will take the necessary steps to find a new resident for your apartment as soon as possible. During this time you will be responsible for paying rent until a new resident is found. Which Rental Agreement is Best for Me? Deciding whether you should sublet or relet your apartment all boils down to which types of rental agreements your community allows. Many communities only allow you to relet your apartment (or a room in your apartment), so you won't have a choice between the two. If your community doesn't allow subleases, then you should not pursue this rental agreement option. If you plan on moving away permanently, then you should look into reletting your apartment. Each rental agreement type has its disadvantages. If you legally sublet your apartment with the consent of your community, you are responsible for any damage caused by the person you're subleasing to and you will have to pay up if the person doesn't pay their rent. If you relet your apartment, you will have to pay rent (even after breaking your lease) until a new resident is found. While your community will most likely work diligently to find a suitable renter, you should bear this in mind. Of the two, however, reletting is definitely the safest option in terms of looking out for you and the community's best interests. If you're leaving and you need someone to take over your apartment as soon as possible, contact your community for more information of which rental agreements they allow. Never sublease your apartment without permission from the community, and never sublet any part of your apartment to someone you don't know. Armed with your newfound knowledge of subleasing and reletting rental agreements, you should be well equipped to decide which type is right for you.